Here is a lovely leaking water outlet in the footpath. 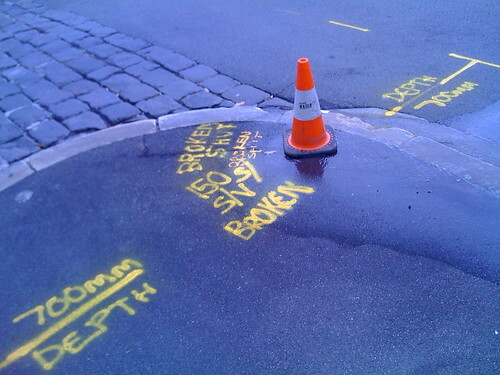 A few days ago Sydney Water put a witches hat on it wrote ‘BROKEN SHUT’ in yellow paint. Today they added a lot more writing. And a man in a Sydney Water truck said there should be someone around tonight to fix it. Come on Sydney Water! The general public are asked to reduce water usage. You should fix your own problems, not leaving them to leak for days. This entry was posted in Photos, Social and tagged graffiti, photo, Sydney, water, witches hat. Bookmark the permalink.